Why is sciforums traffic so low now? Discussion in 'Site Feedback' started by Magical Realist, Apr 7, 2016. Well, that's the beauty of a public forum with multiple contributors who understand logic. It's not like everyone here with a science background grew up in a vacuum. We all know how scientific skepticism works. So you all know what each other thinks because you think the same thing? Sounds like mind control to me. Sounds like explanations to me. What part of 'unexplained' sounds to you like 'explained'? So you are dishonest and just as Bell's says. And yet you continue with your "programmed"nonsense. Are you wimping out and letting Dave think for you because you can't argue your own position? It sure seems like it.. Right..I take people at their word unless I have cause to doubt them. That's called not being a paranoid conspiracy theorist. No, this is exactly being a paranoid conspiracy theorist, because if you believe everything these people say, then there has to be a huge conspiracy! Are you wimping out and letting Dave think for you because you can't argue your on position? It sure seems like it.. I think we have a fairly good explanation as to why SciFo traffic is so low. I can see as usual there is nothing to gain by arguing with a fanatical crank nut. Carl Sagan was captivated by the notion of life beyond Earth. Yet in this interview, conducted shortly before the well-known champion of science died in 1996, Sagan says that extraterrestrial intelligence is "a wonderful prospect, but requires the most severe and rigorous standards of evidence." Sagan doubted that the various proponents of so-called "alien abduction" making headlines in the 1990s had met those scientific standards. NOVA: Speculate for a moment on the parts of human nature, the commonality of believing in abductions, or aliens anyway, and the part of human nature that wants to search for other life forms in the universe. Carl Sagan: I personally have been captured by the notion of extraterrestrial life, and especially extraterrestrial intelligence, from childhood. It swept me up, and I've been involved in sending space craft to nearby planets to look for life and in the radio search for extraterrestrial intelligence. It would be an absolutely transforming event in human history. But, the stakes are so high on whether it's true or false that we must demand the more rigorous standards of evidence—precisely because it's so exciting. That's the circumstance in which our hopes may dominate our skeptical scrutiny of the data. So, we have to be very careful. There have been a few instances in the [past]. We thought we found something, and it always turned out to be explicable. So, a kind of skepticism is routinely applied to the radio search for extraterrestrial intelligence by its most fervent proponents. I do not see [in] the alien abduction situation a similar rigorous application of scientific skepticism by its proponents. Instead, I see enormous acceptance at face value, and leading the witness, and all sorts of suggestions. Plus, the contamination by the general culture of this idea. It seems to me there is a big difference between the two approaches to extraterrestrial intelligence, although I'm frequently written to [to] say how could I search for extraterrestrial intelligence and disbelieve that we're being visited. I don't see any contradiction at all. It's a wonderful prospect, but requires the most severe and rigorous standards of evidence. Could you please comment on the part of the quality of the evidence that is put forward by these so-called "abduction proponents." Well, it's almost entirely anecdote. Someone says something happened to them, and people can say anything. The fact that someone says something doesn't mean it's true. Doesn't mean they're lying, but it doesn't mean it's true. To be taken seriously, you need physical evidence that can be examined at leisure by skeptical scientists: a scraping of the whole ship, and the discovery that it contains isotopic ratios that aren't present on Earth, chemical elements from the so-called island of stability, very heavy elements that don't exist on Earth. Or material of absolutely bizarre properties of many sorts—electrical conductivity or ductility. There are many things like that that would instantly give serious credence to an account. But there's no scrapings, no interior photographs, no filched page from the captain's log book. All there are are stories. There are instances of disturbed soil, but I can disturb soil with a shovel. There are instances of people claiming to flash lights at UFOs and the UFOs flash back. But, pilots of airplanes can also flash back, especially if they think it would be a good joke to play on the UFO enthusiast. So, that does not constitute good evidence. "Precisely because of human fallibility, extraordinary claims require extraordinary evidence." A very interesting example of this sort of thing is the so-called crop circles in England in which wheat and rye and other grains—these beautiful immense circles appeared and then—this was in the '70s and '80s—and then over progressive years, more and more complex geometries. And there were lots of people who said that these were made by UFOs that were landing and that it was too complex or too highly mathematical to be a hoax. And it turns out that two blokes in Southern England, at their regular bar one night, thought it would be a good idea to make a kind of hoax to see if they could lure in UFO enthusiasts. And they succeeded every time—every time an explanation was proferred: a peculiar kind of wind, they then made another one which contradicted that hypothesis. And they were very pleased when it was said that no human intelligence could do this. That gave them great satisfaction. And for 15 years, they succeeded in these nocturnal expeditions using rope and board—all the technology they needed. And in their 60's, they finally confessed to the press with a demonstration of how it was done. And, of course, the confession received very little play in the media. And the claims of alien influence had received prominent exposure. I want you to comment on John Mack. Many of the principle advocates of UFO abduction seem to want the validation of science without submitting to its rigorous standards of evidence. When John Mack talks about parallel universes or other dimensions, he's using scientific ideas. Those have long been in play in the physics and astronomy community. But, there is no evidence for them. He also criticizes the current paradigm that is the skeptical scientific method. But, this isn't validated. We don't believe it just out of prejudice; we believe it because it works. In the absence of hard, physical evidence about alien abductions, what does science tell us about the plausibility of what these aliens are supposed to do? Well, if you look at the advantages in human technology in just the last few hundred years, the Voyager spacecraft on its way to the stars, compared to what we knew in the time of Charlemagne, let's say, that's less than a thousand years. And the progress is simply stunning. So, if you postulate the existence of highly technical civilizations, thousands, much less millions of years in our future, unless the hypothesis strongly contradicts known laws of physics, I think you have to say it's possible. So, travel at very high speeds between the stars, that's by no means out of the question. Walking through walls is a little tough for me—I don't see how it could be done. And the basic reading program idea of the alien abduction, the paradigm, they seem strangely backward in biology for all their advances in physics, if you take it seriously. Why are they doing breeding one-on-one at such a slow pace? Why not steal a few humans, sequence our DNA, look at variations and make whatever genetic engineering changes they want. We almost have the ability to do that. It seems naive in terms of molecular biology. "If I were speaking to a group of abductees, I think the first thing I would do would be to tell them that I'm sure to many of them the pain that is expressed is genuine." Precisely because of human fallibility, extraordinary claims require extraordinary evidence. Now, I know that Budd Hopkins responds that extraordinary claims require extraordinary investigations. And I have two kinds of responses to that. There is a claim that a brontosaurus is tramping through the jungles today in the republic of Congo. Should a massive expedition be mounted with government funds to find it, or it is so implausible as not to be worth serious sustained systematic attention? My second point is that to the extent that extraordinary claims require extraordinary investigations, those investigations must be true to the spirit of science. And that means highly skeptical, demanding, rigorous standards of evidence. There's not a hint of that from alien abduction enthusiasts. I think that the alien abduction enthusiasts understand the need for physical evidence. It's the pathway to some degree of respectability. And for 40 years, they've been telling us that real evidence is just around the corner, it's about to be released, it's being studied at this moment. And nothing ever comes of it. Well, now we've run into this alleged alien abduction footage. Have you heard about this? What do you make of the film footage of this alleged animal autopsy? I haven't myself seen it, but I have talked in some detail with those who have, and I've read an analysis in the Times of London. There are several things to notice. One is that the creature in question has a strong resemblance to the alien abduction paradigm, although with six fingers on each hand. It is dissected in a movie taken with lots of blocking of the body and numerous out of focus excursions by the camera. And the humans involved in the autopsy are all dressed in these 1950's radiation suits which are covered head to toe, and there's just a little rectangular window to look out, which means that nobody can be identified. The key piece of evidence that it's not a fake is said to be a leader from the beginning of one of the [film] rolls. You know, they're all encoded, and it was submitted to Kodak, the manufacturer. And Kodak came back and said this was shot in 1947 or some year close to that. And that demonstrates that it's not a fake. But, an important proviso is that Kodak was not given a reel that had the autopsy on it. They were just given a snippet, and then [it was] alleged that it came from the beginning of the autopsy film. So, I think that it's a clever fake, if it's a fake. But, it's certainly not compelling. According to Hopkins and others, the main evidence for these stories—in the absence of other evidence—is the similarity of details. 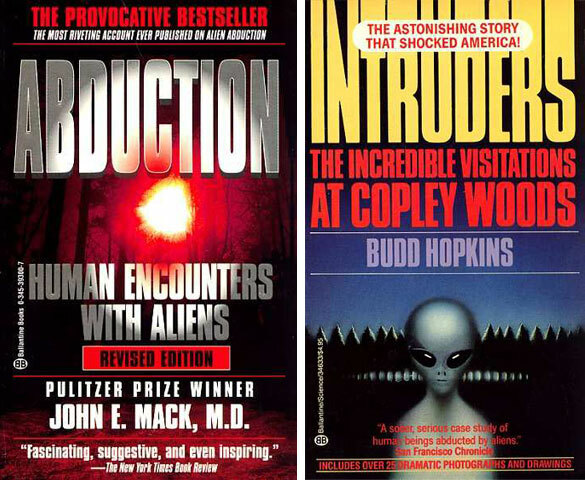 In your opinion, what other explanations might account for the similarity and the details of the stories or hallucinations of these abductees? The culture contaminates. Movies, television programs, books, haunting pages of aliens, and television interviews with passionate abductees—all communicate to the widest possible community the alien abduction paradigm. So, it's not as if each abductee has been hermetically sealed from the outside world and has no input about what others are saying. It's all cross contaminated, and it has been for decades. I think that's the clearest evidence for it not being good evidence—that many people tell the same story. If you could speak directly to the multitudes of people who believe they're going to bed and perhaps being abducted by aliens, what is it you would like to say to them? If I were speaking to a group of abductees, I think the first thing I would do would be to tell them that I'm sure to many of them the pain that is expressed is genuine, that they're not just making this up. And it's very important to be compassionate. At the same time, I would stress that hallucinations are a human common place, and not a sign that you are crazy. And that absolutely clear hallucinations have occured to normal people, and it has a compelling feeling of reality, but it's generated in the head. "I don't think that scientists are prejudiced to begin with. Prejudice means pre-judging. They're post-judice." That being the case, I would ask them to try to be as objective as they can and see if anything like that might, in fact, explain what they said happened to them. And I'd remind them that children, universally, have terrible nightmares, especially around [the ages of] 7 to 11, and wake up from sleep absolutely terrified about a monster, a witch, a goblin, a demon, and why shouldn't some of us retain that? I mean, there's no question that those monsters don't exist, and they're [not] hiding in the closet or under the bed. That's something generated in the mind. Why should it all go away when we grow up? We should retain some of that. And could not something like that be an explanation? I would try to simply ask them to adopt the scientific method of multiple working hypothesis. Right now, they have only one hypothesis and their minds are, in many cases, closed to the alternative. I would ask them to do a serious consideration of the alternative, see if it makes sense. Can you tell us how you feel if someone came to you with good evidence that there was, in fact, alien life trying to communicate with us? How would that make you feel as a scientist? If someone came to me with compelling, bona fide evidence that we're being visited, my reaction would be "Whoopee!" And I'd want to play a role in analyzing the evidence. I would try very hard to bring in the absolute best scientists in the world to study it, depending on what the evidence is like. And I don't doubt that there would be a lot of cooperation from the scientific community. I don't think that scientists are prejudiced to begin with. Prejudice means pre-judging. They're post-judice. After examining the evidence they decide there's nothing to it. There's a big difference between prejudice and post-judice. Right. A huge conspiracy to speak the truth. Just my kind of conspiracy! Carl Sagan: sci-fi writer who is the infallible pope for all science nerds...lol! Wonder if he's related to Ron L. Hubbard? Nothing left but desperation stakes! next we'll get the "I'm being victimised argument"
NOVA: What in your heart of hearts do you expect and hope to find? HOROWITZ: We are literally the first generation that could communicate with an extraterrestrial civilization. The evolution of radio astronomy, the large antennas, the receivers, the computing hardware is unique to our generation and has not existed before. We could—we are the first generation that could establish contact. There are more probably other civilizations out there, sending signals. How can we not try? Contact, receipt of a message would be the first bridge across four billion years of independent life ...and evolution. It would be the end, in a very deep sense, of our earth's cultural isolation. It would be, I think without doubt, the greatest discovery in the history of mankind. NOVA: That said, tell us briefly what we have found to date, and how you feel about that? We've been looking for some years, what have we found? HOROWITZ: There have been—I think—I think the important comment to make about the study, the search for extraterrestrial intelligence with radio telescope—the method that's favored in the scientific community—is that there hasn't been much of it. Really, the first search was in 1960, by Frank Drake. He looked at two stars for two months. Since that time, there have been something like three or four dozen additional searches. Typically searches that go on for a few tens of hours, with a radio telescope somewhere. Most recently there have been continuous searches with a million channel and ten million channel receivers, like the one we're running now. But I think when you add it all up, earth has done very little. It's a big space out there. Lots of places to look. Lots of possible radio wavelengths. Very little has been looked (at). We've just scratched the surface. But in scratching the surface, we do occasionally find signals—these searches have detected signals from intelligent life. However, as far as we can tell, all of that intelligent life resides on earth. ......So the bottom line is there have been a bunch of searches. We all see things from time to time, it is intelligent life—it lives here. And there has been no signal that comes from space that's ever repeated. NOVA: Why aren't you worried when you read these headline stories about aliens abducting people and snatching kids from their beds? Why aren't you worried about these stories, the veracity of these stories? HOROWITZ: You really want a straight answer for that? NOVA: ....You have fair confidence, I understand, that they're probably not stealing people from their beds every night. HOROWITZ: It's that we hear stories. We hear people say that certain things happen to them. And if we ask them for some evidence, such as a garment left behind, or a bolt that fell off the landing gear of the flying saucer that landed in their backyard, or an alien cigarette lighter souvenir, we never get anything. Sometimes we're told that there have been—had an implant. But the implants never seem to materialize. In the last 30, 40 50 years now, we've been hearing about flying saucers, we've been hearing about, more recently, abduction phenomena and so on. But there is zero hard scientific evidence of any sort. There are only anecdotes, experiences earnestly believed but not buttressed by any sort of real evidence. Blurry photographs. Sketches of aliens that, to me, look far too much—far too humanoid, far to much like life on earth, that are not the way I believe extraterrestrial life really will look. And therefore, to me, suggests merely a lack of imagination. How, why should we be worried about such a phenomenon, when apparently it doesn't exist? NOVA: What kind of evidence would you personally need to see, to have you say: Ah-ha, maybe they are here; maybe Budd Hopkins is right? HOROWITZ: We hear anecdotes and we see sometimes videos, blurry photographs of evidence that aliens have landed, that they've abducted people and so on. But we don't have any hard evidence. We don't have the bolt that fell off the landing gear; we don't have the alien cigarette lighter. All we have are stories. The stories are earnest, they're sincere. These people tell them with conviction. At least the—some of the ones I've heard. But it's just a memory, when they're gone. And I say to them: 'That story's great. But can you—can you give me an object? Isn't there something lying around after this visit?' And they say: 'Oh, you want an artifact, you want an object? There was this couple and they were driving along late at night in the upper peninsular of Michigan, and an alien de-dah-de—they give you a story about an artifact. No more stories, just the goods. NOVA: In your position as a scientist ...do you have anything reassuring or comforting to say to people who believe this? You know more about this than a lot of us. HOROWITZ: Of course, as a physical scientist, I'm not an expert on abductions. I think it's extremely improbable that these things are happening. I haven't studied it in the kind of depth in order to be able to say it's complete balderdash. But it seems to me extremely improbable. The fact that we don't have another explanation for the kinds of behavior and memories that people have, does not render that explanation more probable. It is, after all, an extreme interpretation: That there are aliens, that they've come here; that they've abducted people; that they've bred with them to make hybrid creatures. NOVA: How would you feel if a UFO saucer were to land in your front yard? HOROWITZ: You know, I just finished mowing my lawn this weekend. It looks gorgeous. And a flying saucer would really mess it all up. .....You know, we physical scientists sound pretty grouchy about some of these things, and we like to say—we like to be hard-nosed about scientific evidence that aliens are walking around on earth. We don't accept such things lightly. It's an extraordinary claim, it requires extraordinary evidence. On the other hand, let me just say: Physical law does not rule out interstellar space flight. Nor does it rule out interstellar life. It permits both those things, although at great cost. If a flying saucer were to land on my lawn, tomorrow morning, I would be the happiest person on my block. NOVA: Phil, you've been following the so-called alien abduction movement very closely, perhaps more closely than anyone. Tell us how long you've been studying this, and how much evidence you have found to date, that supports the contentions of people like John Mack and Budd Hopkins? KLASS: ... I've been interested in and investigating and following claims of UFO abductions for almost 30 years. NOVA: In all that time, how much hard evidence have you found? KLASS:...In nearly 30 years of searching, investigating famous cases, I have yet to find one that cannot be explained in down-to-earth prosaic terms. Therefore, if somebody says to me, "I have been abducted by strange looking creatures that do these dreadful things to me," I'm quite confident that they could not possibly be extraterrestrials. Maybe they're mischievous Irish leprechauns; maybe they're the mischievous elves of Santa Claus; maybe they are agents of the devil—now I don't believe in any of these. But I have not spent 30 years investigating whether the leprechauns exist. But I am quite confident that there is no scientific credible evidence to show that we've had alien visitors, let alone that they're doing these dreadful things. In essence MR, if I were you, I would go back to my Overlords and explain how you have been done like a dinner, and that you really need new improved material. Your pretense in claiming you are an expert and UFO investigator is really just so much crap, as like the rest of us, all you have is the net. No. You are willing to take the word of a few people making fantastic claims that requires that there is a huge international conspiracy trying to cover up alien visitations and falsify scientific data. You seem to have no understanding of the commitments of your beliefs or of the proportionality of you commitments. No..I take people at their word. Just like from the news and from everyday interactions. I do not project huge conspiracies to deceive and to fake experiences. That's called sanity. But you do. If there were alien visitations like the ones that you believe, then there must be some kind of vast conspiracy to hide this truth.